Personally identifiable information of PTIN holders, specifically limited to the name of individual issued a PTIN, business name, mailing address, phone number, business website address, email address, and professional credentials was originally obtained under the Freedom of Information Act. Only the tax professional’s name, address and professional credentials are disclosed in a basic listing format under the FOIA so that users of this website can verify whether their tax professional is registered with the Internal Revenue Service and holds a PTIN. PTINdirectory.com is not responsible for the accuracy of any information. All other information found in a featured listing available for users through our website is supplied voluntarily and knowingly made accessible to the public by the tax professional who has updated his or her professional listing. With the exception of a name and state which cannot be removed by the tax professional, tax professionals interacting with our website may delete other information, or modify information found in their professional listing on PTINdirectory.com. This includes their address, telephone number, email address, website address or other personally identifiable information. 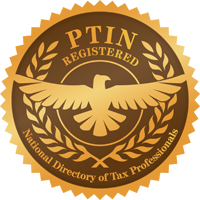 Tax professionals that update their listing constitute their acceptance that PTINdirectory.com may share such information with users of this website, and its partners and agents for purposes related to PTINdirectory.com’s products and services, including for the purpose of contacting them via email about products and services that may be of interest to them. Users may visit our website without telling us who they are or revealing any personally identifiable information about themselves. To communicate with you about your account or the website. To personalize various aspects of the website. To support the operation of the website (i.e., billing, account maintenance) and troubleshoot. We will perform research on our end users’ demographics, interests, and behavior based on the information we collect, for example during registration, from our server log files and from user surveys. We do this to better understand and serve our users. This research is compiled and analyzed on an aggregated basis. We may share this aggregated data with current or potential advertisers, business partners, investors and other third parties interested in our business. PTINdirectory.com does not sell any of your personally identifiable information to third parties. However, if you have not opted out of receiving postal mail from PTINdirectory.com or third parties, PTINdirectory.com may rent your name, postal address and phone number to third parties, which the third parties may use to mail you information. We do not sell, rent or provide your email addresses to any third parties without your permission. All emails you receive are deployed directly by PTINdirectory.com on behalf of third parties. We share website usage information about visitors to the website who have received a targeted email promotional campaign from us with a third-party advertising company for the sole purpose of targeting future email campaigns and upgrading visitor information used in reporting statistics. To allow third parties to provide website features and services. These third parties are not allowed to use personally identifiable information except for the purpose of providing these services. In connection with the sale or transfer of PTINdirectory.com or substantially all of its assets, we will share your data with the acquiring party or transferee. Opt out of receiving future emailed messages by following the “unsubscribe” instructions at the bottom of any emailed message you receive from PTINdirectory.com. Individuals who are no longer preparing taxes and have not renewed or intend to not maintain a registered PTIN in the coming year can request to have their names removed from the directory. These individuals who wish to be removed from the directory may do so by sending an email request using the form on the contact page found on this website, or by writing to the National Directory of Registered Tax Return Preparers & Professionals, Ltd., 2001 Grove Street, Wantagh, NY 11793. In your request please state clearly that you no longer will be preparing tax returns professionally as of a certain date. If you receive communications from PTINdirectory.com or third parties selected by PTINdirectory.com by regular mail, you can opt out of receiving future such communications by contacting PTINdirectory.com’s customer service at 516-409-8357, or by writing to the National Directory of Registered Tax Return Preparers & Professionals, Ltd., 2001 Grove Street, Wantagh, NY 11793. PTINdirectory.com does collect and use some non-personally identifiable, generic information about our users as a means of measuring the effectiveness of our website. PTINdirectory.com servers identify certain user information in the normal course of operation, but such information does not reveal a user’s personal identity. We collect this information only in the aggregate and use it to evaluate and improve our website and to provide targeted information that may be of interest to users of our website. The following are examples of non-personally identifiable generic information. An IP address is a number that is automatically assigned to a user’s computer whenever that user is using the World Wide Web. Website servers can automatically identify individual computers by their IP address. PTINdirectory.com collects IP addresses for the purposes of system administration and to report aggregate information. PTINdirectory.com does not link IP addresses to any personally identifiable information. Settings, technical and other information from your computer, such as your operating system, browser version, connectivity, various communication parameters and other information related to the operation and interaction of PTINdirectory.com website may be collected by PTINdirectory.com. Except as otherwise provided in this statement, PTINdirectory.com will use such information solely in order to provide technically appropriate formatting of information provided by PTINdirectory.com and access to PTINdirectory.com website. The collection of this information will not include any personally identifiable information about you or any individual user. PTINdirectory.com website is not targeted at children and do not collect or use any personally identifiable data from children. PTINdirectory.com shall, pursuant to applicable law, regulation or legal process, such as a search warrant, subpoena or court order, allow access to all available and relevant information in order to comply with such process and protect PTINdirectory.com’s rights and property. PTINdirectory.com may also allow access to this information in special emergencies where physical safety is at risk. PTINdirectory.com is committed to protecting user privacy on all PTINdirectory.com websites and expects the same from our partners, co-sponsors and suppliers. PTINdirectory.com, however, is not responsible for the content or the privacy practices of non-PTINdirectory.com websites, including websites reached through a link on a PTINdirectory.com website. Other websites may have different privacy policies, or no policy. Users should review the privacy policies of any website before providing personal information. Should PTINdirectory.com modify its practices regarding the collection or use of information obtained from users in the future, this privacy statement will be amended to reflect such modifications. Q: There’s my personal address or an error in my listing – how can I correct it? A: Go to the homepage of the PTINdirectory website. Near the top of the page click on “Update Your Listing”. If this is your first time to the website, you will need to create a username and password. If you wish to omit your address from the professional profile listing, you may type “N/A” or write “Not Available for Public Display”. Only your name and state may not be modified. Q: What if I see an error with my name like if the name is spelled wrong or I recently got married and my name has changed – how do I correct that? A: Please email us using the contact form which is found on the “Contact PTINdirectory” page. Q: I am a PTIN registered tax professional. But how do I get my name removed from your site? A: If you are currently registered and hold a valid PTIN we will not remove your name. If you are unhappy with negative reviews we will not remove your name either. Your PTIN registrant information is made available to everyone under the Freedom of Information Act. We respect your privacy and do allow you to remove or modify all personal content with the exception of your name and state which you cannot remove on your own. However, if you have given up your PTIN and you are no longer a tax professional, or you have changed professions or do not intend to renew your PTIN in the future, we will remove you permanently from the directory upon written request. Please use the contact form on the “Contact PTINdirectory” page. You must state clearly that you no longer are a tax professional or that you are changing careers and do not intend to renew your PTIN. Please allow 48 hours for removal. Q: What if I see a review and rating that I think should be removed? Can I have a review removed? A: A review will not be removed just because it is a low rating. However, bogus reviews, whether good or bad, will be removed. Inappropriate reviews will also be removed. Reviews written by the tax professional, by their employees or agents will be removed. If you think a review of yours should be removed, feel free to write to us and tell us why it should be removed. We will consider your request but cannot guarantee we will agree with you. The best way to combat one or two bad reviews is to ask dozens of your satisfied clients to write reviews. Q: I’m going to pose as a client and review myself numerous times to increase my overall rating. A: Never write a review of yourself or have an employee write a review of yourself. We are on the lookout for those self-serving reviews. We use humans, not machines to detect and remove phony reviews. But more importantly, it is a violation of current law. Posing as a client or hiring an outside agency or employee to post positive ratings is a practice known as “astroturfing”, and is prohibited. Q: One of these reviews is false and it’s hurting my professional practice! I want to send you a letter demanding that it be removed. A: We do not accept demand letters because it is not our role to determine whether a review is true or false. You might dispute the truth of a review, but your disputing it does not make it false. Q: If you won’t accept a demand letter, I have no choice but to sue you! A: The Communications Decency Act (CDA) is a complete bar to our liability for the statements of others on this website: “No provider or user of an interactive computer service shall be treated as the publisher or speaker of any information provided by another information content provider.” 47 U.S.C. §230. Federal courts have applied this standard on its terms: “By its plain language, Section 230 creates a federal immunity to any cause of action that would make service providers liable for information originating with a third-party user of the service.” Zeran v. AOL, 129 F.3d 327, 330 (4th Cir. 1997). The ratings on this site are written by our users, not by our company. Thus, under the CDA, we are not the “publisher or speaker” of the ratings, even if they contain false information and we are not liable for defamation, libel, fraud or any other tort claim you might bring. Q: I think my demand letter would put you on notice that the review is false and defamatory. That makes you liable. A: No, it doesn’t. Zeran, 129 F.3d at 227, and the cases following it uniformly hold that it is not up to us to determine whether your demand letter is correct or the review is correct. The CDA gives us complete immunity for the statements that others make on this site. Q: But you lost your CDA immunity by aggregating the user ratings into an average! A: No. The most instructive case on aggregate ratings is the California Court of Appeals’ decision in Gentry v. eBay, which squarely held that such ratings do not transform a publisher into an information content provider. 99 Cal. App. 4th 816, 834 (Cal. App. 2002). Q: But you lost your CDA immunity by editing the rater’s original comments! A: No. Under 230(c)(2)(A), “No provider or user of an interactive computer service shall be held liable on account of any action voluntarily taken in good faith to restrict access to or availability of material that the provider or user considers to be obscene, lewd, lascivious, filthy, excessively violent, harassing, or otherwise objectionable, whether or not such material is constitutionally protected”. Q: I’m going to sue you anyway. Taking down the review is cheaper than paying a lawyer. A: Sounds like a Strategic Lawsuit Against Public Participation (SLAPP)! Twenty-eight states, including our home state, have passed strict anti-SLAPP laws, authorizing expedited motions to dismiss and giving rise to counterclaims seeking attorneys’ fees and liquidated damages.